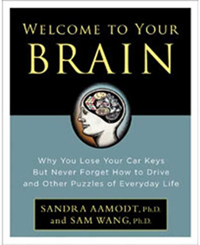 Welcome To Your Brain: You'll be the hit of the party! You'll be the hit of the party! "If you've ever been at a loss for small talk, Welcome to Your Brain offers a wealth of information that might make you the hit of the party." That's from the latest review, which appeared yesterday in the St. Louis Post-Dispatch. We've found this to be the case as well. We often have a great time slipping people nuggets of information. A few months ago I got to sit in the cockpit of a Boeing 767 on takeoff - great fun. I was just about to leave, but the pilots and I started talking. I ended up staying an hour. It turns out their tricks for fighting jet lag are quite similar to ours. Some more reviews can be found here. enjoyed your book, but how can you write about the brain without mentioning the work of Minsky ? at the very least his proposition concerning emotions/intellect ? I appreciate the perspective. Minsky was a pioneer of artificial intelligence. However, he doesn't study the brain. My view is that he has done a good job of popularizing ideas about emotions to the AI community. Anyway, I'll be glad to look over what he's written. If you are interested in reading more about how neuroscientists and psychologists think of emotions and how they guide the actions of real animals (such as us), an excellent place to start is the writings of Joseph Ledoux and Daniel Goleman.